Vox Lux opens with a shock to the system – a scene so stark and well-crafted that its aftermath lingers even as it informs the life decisions of Celeste, the movie’s central character. The movie starts out immersed in normalcy – a high school classroom with the teacher calming down the students’ unruliness so she can start the lesson. It’s the day back from a long break and a return to the ordinary routines are difficult to recapture. The door opens and someone enters. He says who he is then, before anyone can react, he shoots the teacher dead and trains his gun on the kids. In the end, everyone dies (including the shooter) … except Celeste (Raffey Cassidy), who faces a vigorous regimen of physical rehab to recover from her injuries and a more daunting recuperation for the psychological damage. Time perhaps doesn’t heal all wounds – it just turns them into scars. To help mend from the devastating tragedy, Celeste pens a song that she sings at a memorial service for the dead. It becomes an overnight sensation and propels Celeste to musical stardom. However, although her presence in front of a crowd is confident and electric, she has a troubled off-stage life. Cared for by her negligent older sister, Eleanor (Stacy Martin), and her hard-nosed manager (Jude Law), she muddles along through life, getting pregnant as a teen and slipping into a spiral of drug addiction. By the time she’s 31 (and is now played by Natalie Portman), she’s a brittle woman, prone to unpredictable mood swings and haunted by how poorly she has parented her daughter, Albertine (Cassidy). Her 2017 tour (which she refuses to call a “comeback tour,” claiming that she never stopped making music) provides an opportunity to lose herself in the adulation of the crowd – something we sense is the only thing left that has meaning for her. 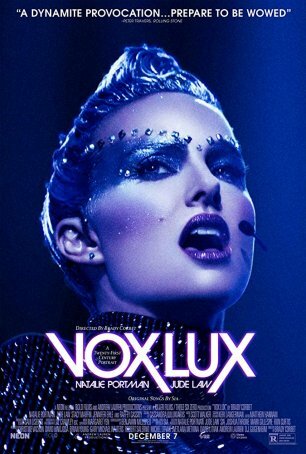 Vox Lux unfolds in three parts – a prologue (the high school shooting) in 1999, a first act, called “Genesis” (circa 2001, with Cassidy playing Celeste), and a second act, called “Regenesis” (2017 with Portman taking over the lead). Although the film tries without much success to draw comparisons between events in Celeste’s life and songs with the “national consciousness” (9/11 is fleetingly referenced), its real strength is the portrait it paints of the central character and the way it doesn’t overreach in showing the long-term implications of what happened to her on that high school day. Her drug addiction is referenced but not lingered upon. She is shown as a functioning (albeit mercurial) individual and Cassidy’s performance dovetails nicely with Portman’s, allowing a seamless continuity despite a gap of 16 years. Act II opens with another shooting. This one, however, isn’t inside a school. Terrorists, wearing masks inspired by one of Celeste’s early music videos, slaughter more than a dozen people at a seaside resort. Celeste and her entourage are forced to address this issue and, for the lead character, it raises uncomfortable questions, such as whether the killers chose their garb knowing Celeste’s history or whether it was an awful coincidence. Writer/director Brady Corbet (making his sophomore feature behind the camera, following The Childhood of a Leader) never answers the question but he wants it out there for the audience to consider. Celeste’s character is assembled from fragments of current and past musical superstars. Turn her one way and there’s a glimpse of Katy Perry. Slant her in another direction and there’s Taylor Swift or Lady Gaga. With the lights dimmed, there are darker facets – Whitney Houston after drugs took over, for example. Those things are all there, boldly embodied by Portman, who has never shied away from difficult or challenging roles. Cassidy is also excellent, both as the scarred younger Celeste and as her same-age daughter whose wounds are from a different source (an indifferent mother) but no less profound. The movie concludes with an extended glimpse of a modern-era concert although it’s not as intent on details as A Star Is Born, the likely Oscar nominee with which Vox Lux shares some plot points (not surprising since both focus strongly on musical superstardom). One possible misstep along the way is Willem Dafoe’s narration – it’s too wordy for the material and doesn’t quite work. Still, that’s a minor quibble about an otherwise dead-on portrait of a lost soul who may never quite find herself but who makes an uneasy peace with what the world has made of her.